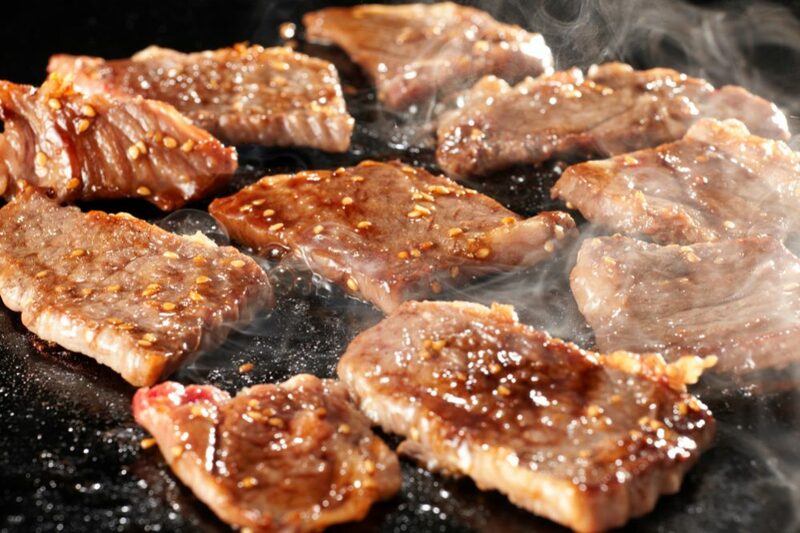 People are often familiar with barbecue grills, but are less aware of teppanyaki grills. The teppanyaki grill is an iron griddle with a flat, solid surface that’s used to prepare food in front of an audience. These grills make great spin-offs for BBQ parties at home with friends and family. Currently, the best teppanyaki grill on the market has to be Presto’s “07061 Electric Griddle with Removable Handles.” This grill not only has the best non-stick cooking surface, but it also is easily compactable by removing the handles. The griddle, itself, heats up very quickly and has even heating across the surface making the cooking experience smooth. The table boasts a great 22 inches by 11.5 inches of cooking space, providing plenty of room to cook large quantities of food all in one sitting. It weighs 6.5 pounds and includes one slide-out, drip tray to help remove excess oils and fats. Teppanyaki grills will often be made up of some combination of metals, plastics, and occasionally stainless steel. The table-top will always be metal, but the important thing to look out for is whether there is even heating distributed across the entire surface. The catch, however, is that the heating will be uneven when it is reaching the temperature it is set to. When it is at that temperature, if it is not heated evenly, then there is a slight defect and the product is not as professionally attuned as it should be. The “PCG-10 Professional Portable Nonstick Griddle” by Broil King is a gray teppanyaki grill weighing 8.5 pounds. It comes with a removable stainless-steel backsplash and grease tray and it has an environmentally friendly, non-stick coating. It can heat up to 425 degrees Fahrenheit, and has cool-touch, stainless steel handles. The unit’s dimensions are as follows: width (29”) x depth (12.5”) x height (5.5”). The dimension of the cooking surface is 21 inches by 12 inches. Out of all of its features, the PCG-10 is highly praised for its non-stick coating making food easy to cook and cleaning to be a lot simpler. With this grill, you will not need any cooking spray. On the other hand, one of the downsides is that the most attractive feature of this griddle, the removable stainless-steel backsplash, is challenging to work with. In order to put the backsplash in place, one must position it directly on top of the non-stick, which can cause scratching on the surface of the griddle over time. It also does not attach directly to the griddle, but to the handles, making this aspect of the whole unit seems like an after-thought. When in use, the backsplash can become extremely hot since it is in direct contact with the non-stick. This could be potentially dangerous. Furthermore, the backsplash is also a very thin piece of metal making it quite flimsy and could potentially be damaged or bent out of shape. The plus, however, is that the backsplash could help keep the hot oil from splashing outside of the griddle when in use. It can also make cleaning up much easier for the same reason. Since this is a removable piece within the whole unit, it is up to the buyer to decide whether or not he/she likes this component and can choose to use it if so. This model also comes with a drip tray underneath the griddle that slides at the bottom which helps collect oils and residues when the grill is in use. It can easily be removed when it’s necessary to clean and helps keep excessive amounts of oil out of the food that’s being prepared. Presto’s “07073 Electric Tilt-N-Fold Griddle” is a 19 inch, 6.51 pound, black teppanyaki grill that is great for every meal. It comes with a large cooking space of 254 square inches and is made up of a heavy-cast aluminum base. The best feature of this particular grill is its ability to literally tilt and fold. The cooking surface can be adjusted to be leveled or tilted making it suitable to prepare all kinds of foods such as eggs and pancakes, and even meats. 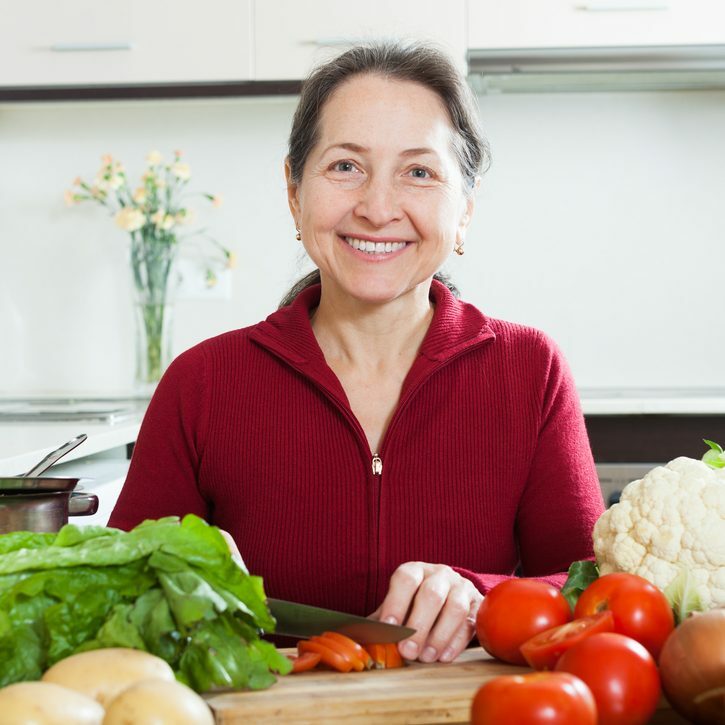 For example, when cooking meats, excess fats and oils need to be drained. Some people dab these liquids with paper towels or napkins, but this is a messy process that isn’t thorough. Furthermore, it adds an extra step for the cook. This grill’s tilting feature allows for easy drainage because these fats and oils simpler fall into the bottom of the griddle and are immediately separated from the meats by gravity. The folding aspect comes from the way the legs can be folded into itself in order to create a compact storage space. This grill is designed to fit into the most standard, 18-inch kitchen cabinets so it does not have to be stored out on the counter, or outside of the kitchen. Furthermore, there is a drip tray that locks in place when in use. It can easily be removed by sliding it out to clean when needed. The only downside is that there are times when this tray does not stay put in its place as it should and can slip out on its own at the wrong angles. If so, there could be a huge mess that is made. If you are looking for a grill to cook mainly meats that rely on a durable drip tray, this might not be the best one out there for you. 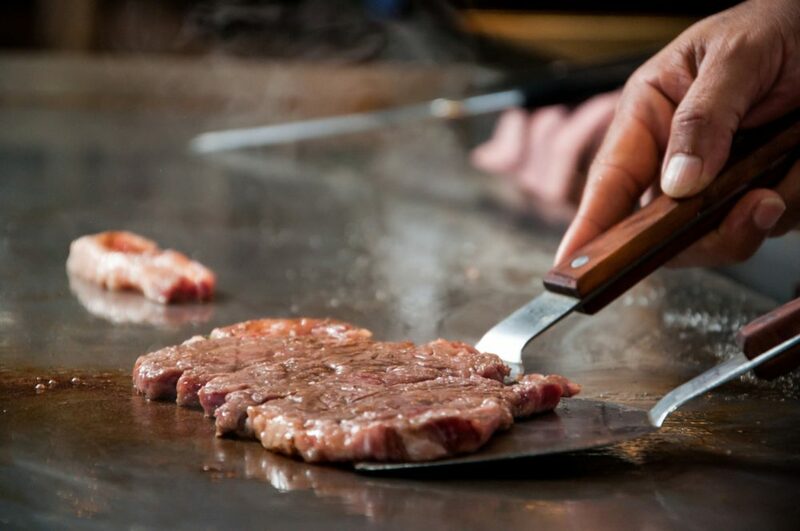 Something that makes this teppanyaki grill competitive with others, however, is its stick-free cooking surface that helps make cooking and cleaning easier to do. In addition, it has a feature called the “Control Master” that automatically maintains the desired cooking temperature on the griddle. A great plus is that the cooking surface is very flat, but also has some texture to it. This actually helps improve the cooking experience. In addition to the 07073 model, Presto also has another version of their teppanyaki grill: the “07061 Electric Griddle with Removable Handles.” This 6.5-pound griddle is made up of plastics and metals, including an aluminum, heavy-cast base. It has a cooking space of 22 inches by 11.5 inches allowing an enormous amount of room for food. Its exact dimensions are as follows: 11.5” x 26.25” by 2.5 inches. This grill has a premium surface providing stick-free cooking and easy cleaning. There is a certain texture that is added to the surface to help provide enhanced, nonstick performance. This electric griddle also has the “Control Master” feature that maintains the desired cooking temperature of the surface of the grill. However, the most attractive attribute this grill has that makes it so popular is its removable handles. This helps with the cleaning process of the actual grill, and also helps to make things more compact for storing. Like the other Presto grill, this one can also fit in most standard 18-inch kitchen cabinets allowing more space in the kitchen for other things. In order to remove the handles, all you do is open the latch clips to detach the handles from the griddle base. This can be done in a matter of seconds and without any tools needed at all. The large cooking surface also allows enough room to prepare food for the whole family in one sitting. This grill also has a removable drip tray that slides easily at the bottom of the unit. This griddle is great because it heats up very quickly shortening the wait time before cooking. It also has even heating once it hits the desired temperature so that food can even be grilled. The non-stick surface is also a favorite component of this grill because it can cook pancakes wonderfully with no oil. Even then, there is no sticking. A great fear people have about this grill is that the handles and feet may become wobbly since they are removable. However, this is not the case. Even though they can be taken off the main unit of the grill, when they are fastened back on they are sturdy, strong, and supportive just as before. Blackstone’s “1554 Outdoor Flat Top Gas Griddle Station” is an easy-assemble, quick-ignition grill that is powered by propane. It is a 36” stainless steel griddle that is made for the outdoors. The grill is located in the middle of the station with two table tops attached on either side for preparation space and an area to hold ingredients underneath. There are four legs that support this entire station and four industrial-strength, caster wheels attached at the bottom of each to make this entire station easily transportable. Two of these wheels are lockable, securing the entire station into place. This adds a great safety feature when cooking. The entire unit measures at 62.5” x 22” x 36” and weighs a total of 120 pounds. The whole unit is easy to assemble and may come with either a rear grease or a front grease drain to help with the removal of fats and oils when cooking. The griddle top is also easily removable to clean when it is no longer in use. This makes it easier to maintain the station and the grill. It has four independently controlled burners with low to high-temperature settings to provide versatile cooking options. Unlike other grills, this allows to have different things cooking at the same time on the same table, but in different sections of the surface. These burners are made out of solid stainless steel so that they last years. The grill is also topped with a thick rolled steel surface for excellent heat retention and distribution, which some might find to be concerning if there are four separate burners that control different temperatures on the cooking space. The product does come with a choking hazard since there are small parts that could potentially be dangerous for young children under three. Another downside is that this griddle needs to be assembled, so if you are seeking something that will come immediately ready to do its job, this requires a little more patience. That being said, it is not difficult to put together and once done can last a lifetime. The biggest criticism regarding this grill is that the drainage system is not perfected. The oils and fats that are released from the cooking are supposed to roll into the grease drip through and catch pan, but instead, they run down the line of one of the legs. This is due to a two-inch hole drilled through one of the parts that intercede the flow of these liquids and redirects them down the leg of the grill station. Blackstone also has a “Table Top Griddle” that is designed for outdoor cooking and utilizes gas for its grill. This premium product offers 260 square inches of cooking surface for versatility and has one zone that is heating control. There are a built-in grease catcher and an electric ignition. In order to be more adaptable to the occasion, this tabletop griddle has a portable design allowing it to be easily transported. This product’s dimensions are 17.3” x 8.5” x 16” and it weighs 21 pounds altogether. The “Table Top Griddle” has a unique, stainless steel “H” burner that heats up the cooking surface really quickly. The “H” design offers even heat distribution and fast cooking with 12,000 BTU heat output. It is easy to use the igniter and also conveniently takes only a 1-pound propane bottle for fuel making this an amazing camping, road trip, and everyday outdoor use grill. The grill is constructed of stainless steel that has a black powder coat and comes with a cold-rolled steel cooking surface. One of the disadvantages of this grill is that it does not come preseason so it needs to be oiled and prepared accordingly before being put to use. In case you’ve not accustomed to seasoning a grill, the Table Top comes with directions that have a recommended oil to use and also includes some guidance that helps make this process less daunting. Besides this slight inconvenience, there is not much to say that is an alarming disadvantage about this grill. It can fit eight large hamburgers on the cooking surface easily and is great at evenly spreading the heat with its “H” design. This is an amazing grill because it is easy to use and easy to clean. When the top is still hot, simply pour water over the surface and any food residues will come right off. This is also a more heavy-duty grill for those who are excited to cook lots of meals in great quantities. This is definitely an amazing teppanyaki grill if you are seeking one for the outdoors. There’s no real assembly required except for a few screws that need to be put in place. Little Griddle’s GQ230 is a 100% restaurant-grade, stainless steel griddle that comes with an even heat cross bracing. This charcoal or gas grill is advertised to be a professional quality griddle that has removable handles and is great for camping or hosting parties. The dimensions measure out at 25” x 16” x 6.5” and the entire unit weighs 14.5 pounds. The underside cross-bracing design promotes even heating on the surface of the teppanyaki grill. The detachable side handles allow the option to cook without them while also being able to save storage space. These refasten securely with zero wobbliness and allow for easy movement when cleaning. This grill is smaller than others on the market making it easier to travel with or to store. This can be a downside, but it can also be what you may be looking for if space is an issue. This grill is silver/metallic in color since it is made of 100% stainless steel and is extremely durable. It does not dent and has a little extra weight on it for the size it is. This contributes to its durability making it a grill that will really last a lifetime. In addition, the weight helps stabilize the grill when in use so it does not move around when it is being cooked on. The only time there is movement is when scraping occurs to remove the charred food that is stuck to the table top. This is something that can be avoided by simply holding the grill’s handle with one hand and scraping with the other. The grill heats up quickly and takes about 6-7 minutes to reach 500 degrees Fahrenheit. The only real downside is the fact that food typically sticks to steel. There are specific tepanyaki spatulas that are great for cooking with and for cleaning up the surface table with. If this grill is something you would be interested in, then it might make sense to look into some of the tools that go with these griddles. It would make the clean-up afterward a little easier. Maintenance of these grills is so important to preserve the cooking ability of these products. Little Griddle’s GQ230 also comes with a front tray to help drainage of the excess oils. This component of the grill works flawlessly and is easy to clean up afterward. Lotus Analin’s “Grid Electric Teppanyaki Table Top Griddle” is an electric grill that comes with a baking surface of 35” x 9” while weighing 7.55 pounds. This light grill has a great amount of surface area for cooking and is powered through a 35” cord that comes with the unit. The thickness of the grill is 0.09” and it comes with multiple wooden spatulas that are 5.5” x 1.5” each. This electric grill is amazing because it is so long and offers so much space to cook food in large quantities. Typically, teppanyakis come in either rectangular shapes or sometimes in more circular forms, but there is always a limitation. This is by far one of the larger teppanyaki grills that come as a rectangle shape. Impressively, this griddle heats very quickly, but not evenly. The side of the griddle that is closer to where the chord connects heats up faster first, which may seem natural assuming that the grill is in the process of heating up. On another note, this is a difficult grill to use for camping if you have a limited amount of space. This grill does not fold up or turn into a more compact version of itself in any way. It is simply as it is making it durable and straightforward as a product, but maybe not so travel-friendly. The other downside is that a lot of teppanyaki grills stand at a height where they can be placed over stove burners if people want to cook with them indoors. However, this grill has some awkward legs making it stand a little low; it is unable to rest over stove burners. Also, over time, some of the leg attachments have sunk in and appear as though they will they may melt from the heat off the griddle top. Another thing to take notice is that this grill requires adequate ventilation and maybe even a fan. Ventilation is necessary for all forms of cooking, but this grill in particular needs some extra air circulation to keep the smell of the food it is cooking from sticking onto the furniture around if cooking indoors. 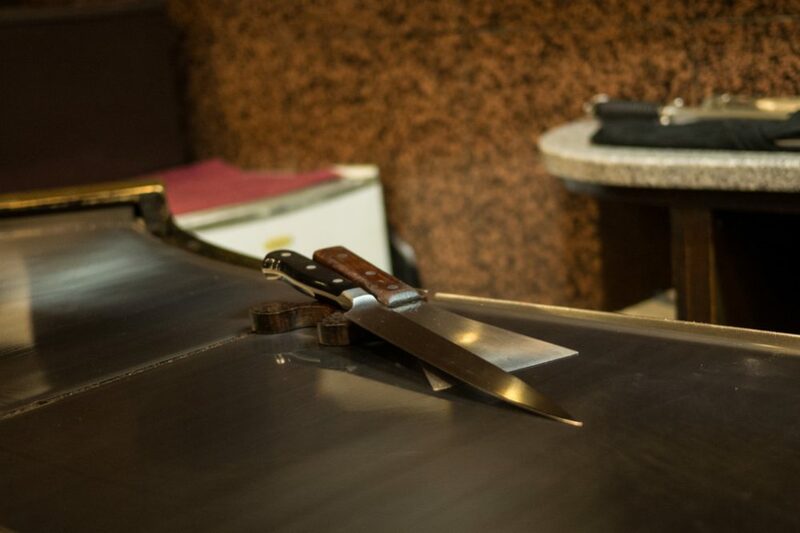 It is important to know that once you have your own teppanyaki grill, there are things you want to do to take care of it. The first is to preseason your grill if it came to you without being preseasoned. This concept is usually explained in the instruction manuals of the specific griddle you receive. However, the general process usually involves oiling your grill upon arrival, without cooking on it yet, and then burning off the oil. This process is typically repeated three times before any cooking is to be done. It is best to follow the instructions that are in the manual you receive for your grill. If you are keeping your grill outdoors, it is important to buy a protector or cover to help preserve your grill from damage. These grills will often protect the metals that make up your grill from weather and debris as well as from moisture. Most grills that are for the outdoors can be disassembled or folded into compact versions of themselves to help with the storage process. However, it can also be nice to have easy access to the grill right outside in the backyard. In that case, protect the grill with a cover so that it works properly and does not get damaged. Finally, when you are cooking indoors, no matter what it is imperative to have proper ventilation. These teppanyaki grills are no exception. When cooking indoors make sure there is enough fresh air circulating into the house. It could help to have a fan. This will not only protect the health of those in the house, but it will also prevent the smell of the grilled food from becoming embedded in furniture and clothes. If you are still finding that the smell is settling into your home even with proper ventilation, it can help to light a candle or two in the room afterward. But again, make sure there is a window open. Presto’s “07061 Electric Griddle with Removable Handles” is the clear winner of the teppanyaki grills discussed here because it hits each of its attributions on point. The removable handles help make it compact with options, but also maintains its sturdiness when put in place. The heating is equally distributed on the surface table with no noticeable differentiation, making the cooking top a great space. It has a large amount of space allowing for plenty of room to cook while also have the best non-stick cooking surface. This is exceptionally the best out of all the other grills making this the easiest and most comfortable grill to use.